PRESS RELEASE … PRESS RELEASE … PRESS RELEASE . . .
Day 3 - The Homecoming. In 2001 Scottish writer, actor and director John J. Taylor performed ‘The One-Man Odyssey’ for the first time to great critical acclaim at the Pittenweem Arts Festival. This year, eight years after the original performances, John returns to his hometown to tell this timeless tale in a simpler way more befitting to the bardic qualities of the original. 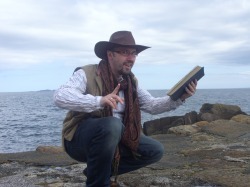 In this series of performance-storytelling events, John will make his own mini-odyssey along the shorelines of St Andrews and Pittenweem, telling the story on three consecutive days in different areas of Fife’s beautiful coastline. The three acts can be enjoyed in a series, or as individual stories. In this one-man show John plays around 20 characters, picks up his mandolin, and inspires his audience to imagine they are in the mythical world of Homeric epic. In the processed performances, crowds will be shown the troubles of Telemachos, they will witness the blinding of a one –eyed monster, the metamorphosis of men into pigs. Hear of the sorrows of Penelope and the shamelessness of her suitors. ‘The Odyssey’ is an exciting and touching story which is an integral part of Western literature; this part of the heritage left to us by the Greeks should be known and enjoyed by everyone. Theatre Odyssey is the UK’s community arts organization dedicated to the promotion of Classics, and now has divisions in Fife, West of Scotland and The South East. You can find out more about them and how to get involved at www.theatreodyssey.com. The organisation was set up in 2000 when John, then a University student at St Andrews University, was inspired by the Greek and Roman worlds, but was disgusted he had never been exposed to them until his final two years at school. John J. Taylor is available for comment and interview to members of press and media. Email john@theatreodyssey.com for more details.